Every year we try to give out at least a little something to the great men and women who have taken up the call to prepare and fill the mind’s of the future generation. Yes, I am talking about teachers and showing them how much we appreciate all they do! 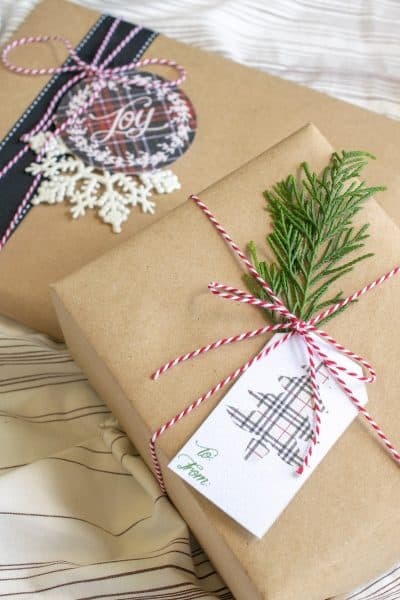 In addition to my own cheeky free printable, I am joining with seven other talented ladies for a collection of DIY gifts that are personable, fun, and unique – just like the teachers who will receive them. Check out the rest of the projects at the bottom of this post. Every year, we make a special thank you gift for my son’s teachers at Christmas time as well as the end of each school year. Time certainly seems to pass to quickly at this age and it seems like just yesterday I was taking those special first-day-of-school pictures and fighting a wave of emotion, part sadness/part yipee, as he boarded the bus. But as Christmas nears, we definitely want to celebrate the new friends and teachers who have helped him learn and grow into a very sweet young man. The most fun thing about gifts for Blake’s teacher this year is that I get to throw some extra personalization in them. You see, his teacher is a BIG Star Wars fan. Although I cannot say that I am well versed in all that is the galaxy far, far away, I can certainly do my best. I also figured that with the release of The Force Awakens earlier this year and Rogue One coming out in theatres in December, there might be a few Star Wars aficionados that would appreciate these little gift tags. Although the tags are free for download below, if you wanted some extra personalization, they are really easy to make. The font is Star Jedi and I chose it because it is 100% free for use. I overlayed them on a starry sky background and cut the shapes as needed. You could probably make your own in Microsoft Word or use PicMonkey if you don’t have any design software. Of course, Blake has many teachers and we try to include them all including the librarian, music, art, and PE teachers who have made a big impact on him. They all do such a great job! For his teacher, I wanted to give the gift a bit of a theme. 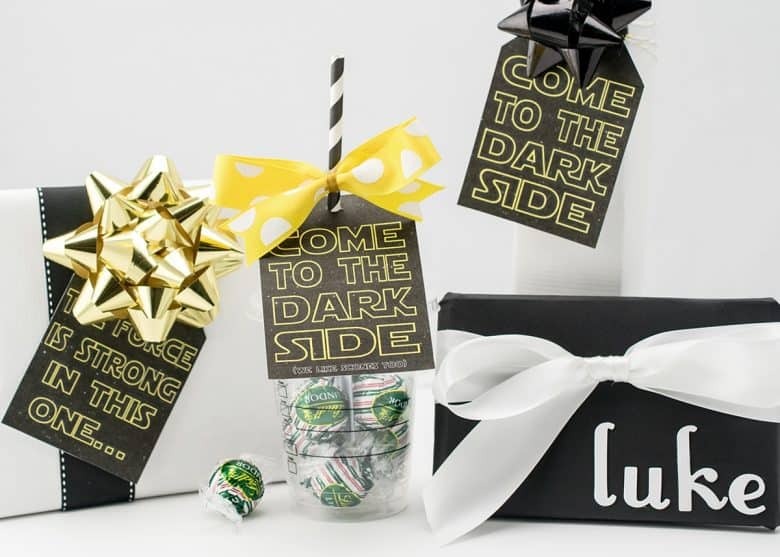 The “Come To The Dark Side” tag is a phrase-pun and we played with it by giving dark gifts such as a Starbucks coffee giftcard and a few dark chocolates. It is a simple gift, but I hope she enjoys the little joke. DOWNLOAD THE FREE STAR WARS THEMED TAGS HERE! Thank you to all the wonderful teachers and happy holidays! We are huge star wars fans here so I can’t wait to use your printable. Such a lovely idea! The Star Wars tags are such a hoot…especially with the dark chocolates and coffee! Thank you! I know she will really appreciate them. At least my son tells me so, haha. Rachel – this is soooo cute and I love how personal it is! What a fun idea! Thank you! This was a really great hop. It gave me some ideas for the other teachers my son has. LOVE the Star wars printables! So fun!!! I love these–thanks for sharing! Pinned to my teacher gifts board! Thank you so much, Christy! I can’t wait to hear about her reaction to the gift from our son. Those are absolutely adorable! Great idea!